View of “Joy Feasley and Paul Swenbeck: A Hatchet to Kill Old Ugly,” 2014. 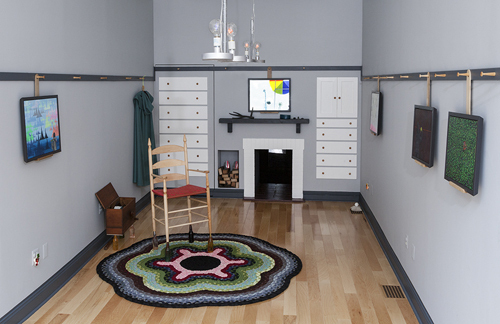 “A Hatchet to Kill Old Ugly” is a three-part exhibition in the Fabric Workshop and Museum’s storefront project space that comprises a Shaker-inspired domestic interior, a dim crawl space, and a back-room atelier swarming with colored light. It is the fifth and most collaborative dual show for Joy Feasley and Paul Swenbeck (a married couple), both professional museum preparators. They each present new works—Feasley’s are acid-hued landscape and still-life paintings; Swenbeck’s are jagged-edged, plant-inspired ceramics—in environments they built, which contain constellations of objects with distinct ontologies, such as historical artifacts, handmade replicas, and magician’s materials. With an auto-curatorial approach reminiscent of shows like “Rosemarie Trockel: A Cosmos” (2012–13), this is an essayistic exhibition-as-interpretive-text on the artists’ work. In the austere domestic interior, replicas of a Shaker willow-branch broom and taupe felt cloak hang on wooden pegs alongside Feasley’s painting of a butterfly in a four-leaf-clover field. Crawling through a faux brick hearth, one enters a low, dark, mirrored closet in which a mechanized mobile—made up of turned wood, tiny bells, and twisted metal—clangs eerily. Seen from here through the storefront window, the outside world seems freakishly ordinary. The third room, in contrast, reveals the exhibition’s seams. The sink and the closet’s raw plywood exterior jostle with magical objects including primary-colored dowsing apparatuses. Taken as a whole, the show celebrates the illusionistic craft of exhibition making, while placing the artists’ individual works in conversation with their referents.